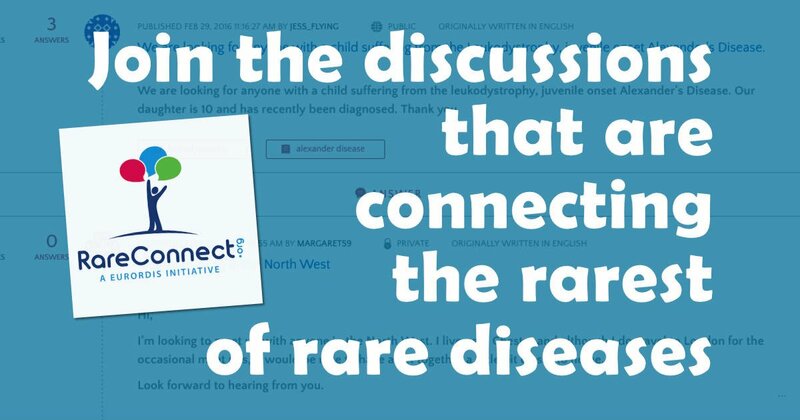 I've written on SNJ before about how the online community I help to manage, RareConnect, works to bring together families facing the challenge of living with rare disease. We now have 87 multilingual communities for different conditions, including those whose disease remains undiagnosed. However, we realised there are still many people out there who can't find a support group or specific online community, because their, or their child's, illness is in the 1 in 1 million range and there isn't yet any online "space" for them to call home. So we came up an idea for a new, cross-condition arena called Discussion Groups. We launched it last year and there are now over 100 groups with as many different topics. It's easy to ask your own question. The Discussion Groups are a place where everyone affected by a rare disease can connect with others online and talk and ask questions about wider topics that affect them, such as setting up a patient organisation for a rare disease, gene therapy or genetic testing. To have a full RareConnect disease-specific community set up by our team, you still need to represent a patient organisation. So if you've already formed an official group for your condition but you don't have a community space of your own, check out the steps for creating one with us. It's free to do so. However, if you don't have a patient organisation and you're searching for information on your condition, our Discussion Groups are the perfect place to start looking for other people or families who have the same diagnosis. You can think of it as a way for someone who has a disease with no existing support group to “plant a flag” online, so others also searching can find you and reply within the safe space of RareConnect. For example: “Does anyone have experience with multi-focal motor neuropathy (MMN)?” Read the reply here. Getting started is so easy. Just register and post a new question or perhaps you might like to write about your experience in a blog/story. If you have any questions or want help in finding others, you can write to us at RareConnect. We speak several languages and we're dedicated to supporting our members as they seek new friendships to break the isolation people living with very uncommon conditions can feel. We look forward to meeting you!